Having a down feeling after a major life setback or failure in some kind of endeavor is normal. These failures might make you feel worthless or useless. After wallowing on your pain for a day or two, you should feel better to face another day. However, if the feelings of worthlessness is long overdue and is getting worse with the passing of days, it might indicate that you’re having an inferiority complex. Inferiority complex prevents you from seeing your true worth and focus only on your flaws. It gives you a thousand reasons why you can’t do a thing rightly and why others perform better than you. People having an inferiority complex think only of their weaknesses and see every situation through this lens. Some root causes of an inferiority complex can also be traced through childhood experiences that leave a permanent dent in a child’s psyche. This child will grow up having self-doubt and feeling not good enough compared to other people. 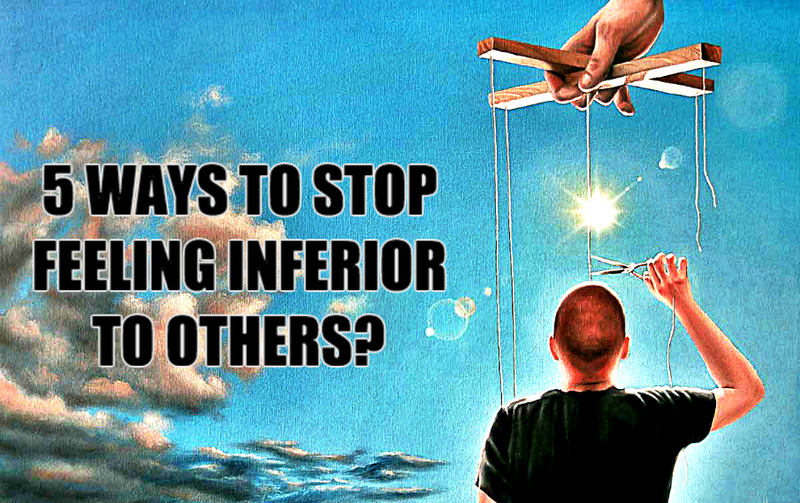 Identifying the symptoms of an inferiority complex is the first step in overcoming it. Here are some of them and the ways to face them. 1. You often have feelings of worthlessness. Feelings of worthlessness commonly arise when you keep comparing yourself with others. You have this fixed notion that everyone you see has a better life, better qualities, and better skills than you are. You see others as entities who could never go wrong nor can have any bad days. 2. You are overly sensitive to criticisms. You react quickly every time you receive criticisms. Even the most constructive ones make you shrink and doubt your abilities. Because criticisms make you vulnerable, you choose not to say a word or do a thing. 3. You have a preconceived idea that people don’t like you. Even if you’re not sure what others are thinking, you imagine that others don’t like you. Or, if you’re about to meet people, you believe that they would have a negative judgment about you the moment they see you or come to know you. Thinking this way, you will behave in a way that others don’t approve of. Eventually, you repel others from liking you. Because you don’t feel you’re good enough, you don’t have the strength to stand for yourself. You’re submissive to the whims of others to the point of being abused by them. Instead of finding your own voice, you settle for it as if it’s the lot life gives you. 5. You are a perfectionist. You believe that everything you do has to be perfect. Whenever you fail to do something perfectly, you see it as utter failure. Everything has to be flawless and must pass the high standards you have set upon. Like any other personality problems, you can overcome inferiority complex by doing the inner work that helps you heal. 1. Get inspiration from others instead of wanting to be like them. People are normal human beings who share the same traits as you. They also have pains, have soft spots, have rough edges, or might have been going through difficult times. When you come to understand people, you will come to understand yourself. Know the stories of great men and women. Their stories will give you light that you are more than what you think and your worth is more than you could ever imagine. 2. Use criticism to your best advantage. Whether given in a positive or negative manner, you can use criticisms to your best advantage. See criticisms as a gauge of improving yourself and not a way to put you down. Criticisms are hints that point you to the aspects of yourself that needs improvement. 3. Be yourself and build self-confidence. Be the self that you want to be not the self that you think others might dislike. Begin by accepting yourself as you are. By self-acceptance, you are giving others the reason to accept yourself too. Think and act in a manner that builds your confidence. 4. Develop your own voice. Realize that you weren’t born to be a doormat other people have to step on. Find the inner strength and work on it until you’re able to stand on your own and defend yourself. Stop your negative self-talk and start with the positive ones. 5. Practice self help therapy. While seeking professional help is a common solution for perfectionism, self help therapy works equally good, as long as you’re determined enough to get the best out of it. You can heal yourself by journaling, having self discipline, self monitoring, and being honest with yourself. Keep in mind that you’re not sent into this world to be perfect; but to be happy, to live your best life, and make the small corner of your world a much better place because you’re a part of it.